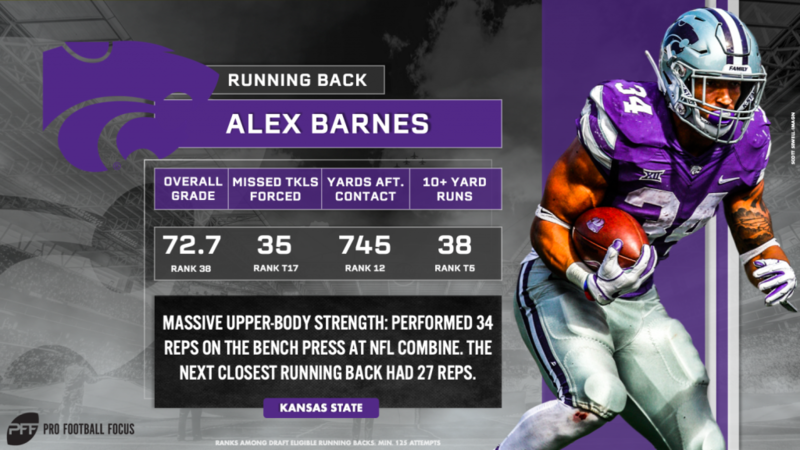 Alex Barnes wasn’t a known running back prospect before he lit the 2019 NFL Scouting Combine on fire, throwing up a position-high 34 bench reps and recording top-five times in the three-cone, short shuttle, broad jump, and vertical jump. Oh, and his 1.58s 10-yard split ranks inside the top-20 among all backs that weighed in at 220 pounds or more at the Combine since 2003. The stunning performance pushed many to Barnes’ tape to get a taste of what they’ve been missing, but the NFL teams that already pored through the Kansas State phenom’s career had fallen head over heels for Barnes long before the bench reps. And, surprising the many just now getting to his tape, teams mentioned his patience – not his natural athleticism or physique – as his top trait. “A lot of coaches did compliment me on my all-around skillset, my patience at the line of scrimmage and how I was able to find holes and creases that maybe weren’t necessarily there,” Barnes said in a March interview with Pro Football Focus. Barnes averaged just 0.14 forced missed tackles per carry and 2.9 yards after contact per attempt a year ago, ranking outside the top-50 draft-eligible backs. But his low figures in the two categories are products of his patience, not his inability to make defenders miss or shed tacklers. He has made a conscious effort to allow his blocks to set up, keep his lane options open behind the line of scrimmage and avoid contact rather than force his way through it. Film has played a pivotal role in Barnes’ constant improvement and overall success. He watches film of himself, his opponents and other successful backs to improve his decision-making behind the line of scrimmage. In addition to identifying defensive tendencies, formations, audibles and secondary looks of opponents during game weeks, Barnes has popped on the tape of an NFL back famous for his patience. Where Barnes has no role model to look up to is the weight room, as he is, quite frankly, in a league of his own in that department. He works out twice a day, opting for strength and power routines in the morning and conditioning or footwork in the afternoon. He’s maxed out at 395 pounds on the bench and 565 pounds on squat. He’s adamant about maximizing his potential and knows that starts in the gym. Patient on the field and feverishly eager in the weight room, Barnes is the complete package built for the haul.